This is one of the things i love about other european cities.. they have these amazing cafes where you can relax chill and have a cocktail. Was it in London those umbrellas would be up and it would be horrible and wet out. The whole gang together outside the Special Court of Lebanon also where Charles Taylor's case was held. Made a new friend who just couldn't seem to control his bowel movements any more.lol. 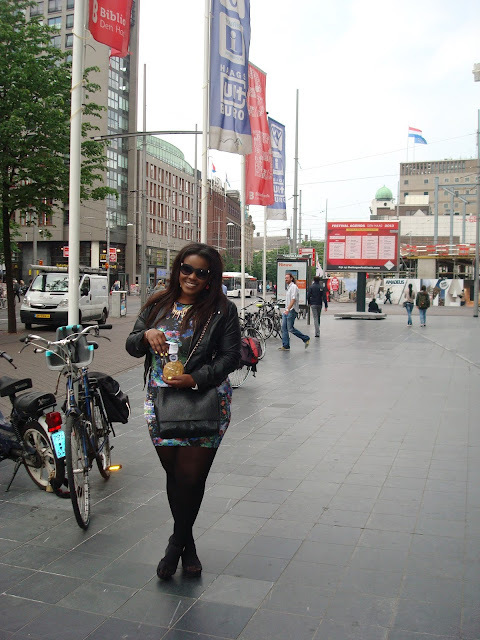 For out second day in The hague.. we walked and when i say walked i mean WALKED. Our team leader seemed to have forgotten his mind some where and so we just kept getting lost! Not only did we miss out stop on the tram and have to go back on ourselves but we also walked around in a circle trying to find the Special Court of Sierra Leone. I have to say though the talk we had made up for all the morning madness. It was interesting understanding why the Special court have succeeded where others have failed, And by others i mean the International Criminal Tribunal of Rwanda. But enough of the boring Law and politics stuff and some fashion. hahahha... my little friend followed me around the city for a good hour i swear. I kept seeing him every where. Great Outfit. I Love your Dress. It fits you perfectly! PS. : Great Blog. Maybe we could follow each other ? hahaha your post always make me laugh! loove the dress, so cool! Hey! We're already following each other with GFC but as Google Reader is closing in a few weeks, what do you think about following each other with bloglovin? let me know and I'll follow you! thank you hun... i love you blog as well and i guess mine is just full of my crazy thoughts.lol. Hello,girl. nice blog, shall we follow each other.